From joiners and ground workers to supervisory and senior management, Dale Contractors are committed to improving skills right across the workforce. We are currently working with the CITB to train or OSAT accredit our entire workforce to a minimum of NVQ Level 2. We have also achieved CSCS cards for 90% of our whole workforce. Staffs are also currently being assessed for the NVQ 3 Heritage Skills award and attend regular CPD events for heritage skills. As a minimum all site staff receives a Site Safety Awareness Course, an Appointed Persons First Aid Certificate along with a programme of trade related training. In addition we have an in-house NPORS accredited Plant trainer and examiner and Dale Contractors Ltd are accredited training providers with the NPORS. Apprentices are an important part of our company and this year we have three CITB apprentices training at Burnley College and Reaseheath College. 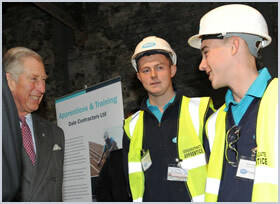 Nathan Holgate and George Braithwaite can be seen here meeting Prince Charles at the Weavers Triangle Heritage Site in Burnley.